We absolutely love stripes on a wall. Vertical stripes instantly add a feeling of height to a room, while horizontal stripes enhance a feeling of spaciousness. 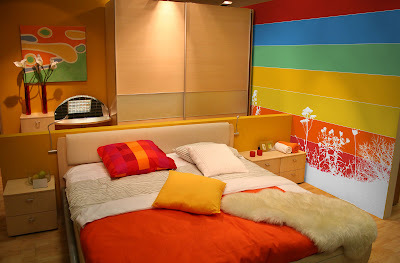 Random stripes, stripes varying in width and color are one of the most visually interesting ways to cover your walls. In fact, we painted a wall of stripes in our studio about four years ago when we moved in. The process of taping lines and re-taping took just over 14 hours for a single large wall. That's a time investment we can no longer afford; the solution: stripe custom wallpaper! Consider an artist like Mark Rothko. His paintings that usually consisted of only a few broad swaths of color is about as high art as you can take the stripe. Use this artistic inspiration for the jumping off point for a stripe custom wallpaper installation. Your stripe wallpaper may have a rough outline like a Rothko painting, graphic in nature but with a very organic sensibility. You may like a cleaner, sharply outlined stripe wallpaper like the inspiration room above, which features a multi-colored striped wall mural, with a graphic silhouette of flowers mingled at the bottom. Stripes allow you complete freedom to experiment with mixing many colors. Custom stripe wallpaper lets you use colors in combinations that may not have been so easily achievable with off the shelf decor products. Mixing the scale of the stripes is another way to customize your stripe wallpaper. Broad stripes emphasize a feeling of space in a room, while tighter stripes evoke a more classic wallpaper pattern, but offer a lot of detail upon closer inspection. So whether you like a thick, thin, vertical or horizontal stripe, our designers will be able to create the stripe covered wall that you've always wanted but haven't had the time to paint. This design is bright! Brighter than the previous post, and also has a lot more energy to it.